Araucania Ranco Solid in green. Its a very full green and the same as my red, big and smooshy. Norfolk Yarn started stocking colinette jitterbug. I’ve seen it all over the web but never actually felt it. I fell in love from first sight and bought two hanks of the stuff. One in a wonderful deep navy blue with light shading and another green, this one more muddy and on the yellower and mossier side. Both are fondled regularly. Finally my big spend was 4 hanks of pure silk. I’ve not got the details with me now but at £13.40 per skein of 50g it was a HUGE spend on some very luxurious yarn. I’m saving this for myself. I think I may save them all for myself but first I have to take photos of it all and get it in my ravelry stash. I’m tempted to keep it off ravelry until I get it ready to knit. Denying that my stash has now grown so big it does not fit in the two boxes under my bed. 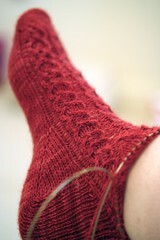 I did order some other yarn from a sale online from pureknits.com prior to Christmas but as yet I am still waiting. Even though it arrived in the UK on 13th December I’m sadly bereft of the yarn and hoping that one day it will reach me. Now on to new year. On short notice my brother called and we all headed over to his house for the evening. I’d driven to Cambridge on Monday morning for work and came back around lunch time. I completed work around 4pm, then got myself together, packed the wii and the wellies and the camera and went to his. All my family were there and we had a wonderful evening of playing with the bowling and other games. Everyone took part which kind of made the evening. Mum and Dad left shortly after midnight and Scotty and I disappeared in to the back garden to play with his new torch and the camera. Light fun was not as successful as we hoped but it was fun. We camped on the dining room floor which was ok until I realised my wonderful and lovely posh air bed had a slow release hole. By 4am ish I was sleeping on the hard floor, by 5am I was on the sofa drifting back off in to dream land. My sister and her kids stayed over too so once the twins were up at 8am the entire house rose and we all had breakfast together and let the kids play some more on the wii. I loved it, although tired it was great. New years day was spent on the sofa knitting again, trying not to sleep so I could get a good nights sleep for work. The cable heart cascade socks are coming on great and I am so very very happy with the inspired idea of breaking the flowing pattern and twisting it around the back of the leg. The only issue is I will have great trouble in producing this pattern for others to use, I want to do it but because of the pattern transfer I had to move to double pointed needles whilst the pattern traveled behind the leg. Over all a very happy Christmas and new year has been had. I have sooo many things I need to achieve this year I think listing them would probably make me want to scream. What with the wedding, making felted flowers, knitting and pattern writing which I’ve not even started on yet… EEP Although being ready to start it all is a nice feeling. Hope you all have as much to look forward to this year as I do. I’ll have to pay a visit to Norfolk yarns next time I visit. Mary sent me over to see your very pretty socks and indeed they are lovely – I do hope you publish the pattern, we can wrangle a DPN or two in a good cause!